Generally bounded by Osborn and Thomas roads, 15th and 19th avenues. The home style in the North Encanto Historic District is overwhelming the Transitional Ranch, with low-pitched roofs and steel casement windows. Usually at least one window magically defies window-ness by bending around a corner in these clean-lined, brick homes of the residential North Encanto District. Harking back to the post WW-II days of a chicken in every pot and a car in every garage, most homes in North Encanto have a detached garage for one, if not 2, cars. The circular pattern of the street layout echos the layout of the Encanto-Palmcroft streets farther south, a calming departure from the usually grid-like layout in historic Phoenix. Whether you want a modern remodel with stainless steel appliances and polished concrete floors or you’re looking for an original Ranch with tiling accents in now-unattainable shades of green or pink, chances are good you will find the Ranch of your dreams in North Encanto. There are almost 1-square mile of them here, and most look much the same (from the outside anyway) as they did the day they were built. Even homes that haven’t been modernized have a modern feel about them—that 50s thing, if you know what we mean—with more closet space and roomier rooms. Typically 3 bedrooms and 2 baths, averaging 1700-ish square feet, these moderately-priced homes just offer more space than the smaller Bungalows built in the 30s and 40s. 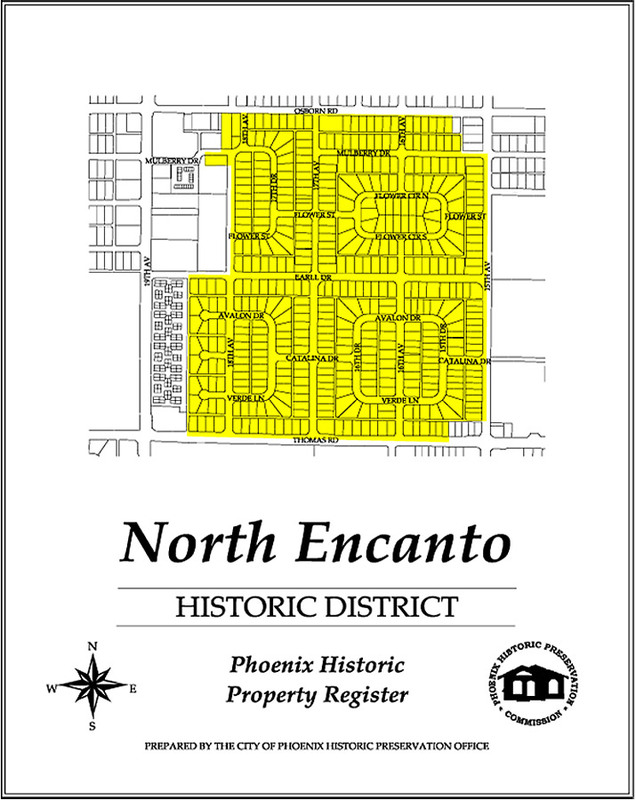 If you are looking for a residential neighborhood that is close, but not too close, to the central city, and a home that has space, but not too much space, North Encanto Historic District may be your place. And if you like the feel of North Encanto, you might also want to check out Campus Vista just east of 15th Avenue or Country Club Park Historic District near 7th Street and Thomas Road. NENA, the North Encanto Neighborhood Association, is a great source of neighborhood information.